The most popular eyebrow mod for Skyrim, Brows - from Hvergelmir's Aesthetic series is now available for Skyrim: Special Edition! Fixed eyebrow normal map - I had saved it in BC5 as you would for Fallout 4 normal maps. This introduced some undesirable glow effect, and "light" brow variants would not look light as intended. Fixed fomod path for MO2 users. Fixed a bunch of previously unknown (nobody mentioned it to me) path errors to certain brow styles. They're now fixed. Cleaned in xEdit, so that is no longer required. Brows is without a doubt Hvergelmir's most popular mod to date with nearly 2 million downloads and roughly 700,000 unique downloads. Brows is also, without a doubt THE mod you think about about, when thinking about eyebrows for Skyrim. If you didn't use Brows for Skyrim, you're either a peasant or have been living under a rock until now. 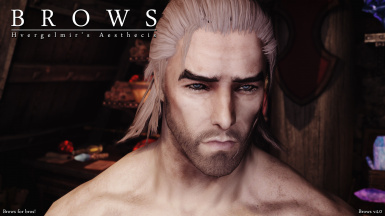 Now Brows is also finally available for Skyrim Special Edition after countless requests (and some threats on my life). So what are you waiting for? You know what Brows is all about already, go download! Brows is part of Hvergelmir's Aesthetics series, a mod series that aim to replace all of vanilla Skyrims character genration textures, include eyebrows, hair, eyes, beards, tint masks (war paint), scars, and detail maps. This was always the plan, and slowly, but surely I'm creeping towards that end goal. 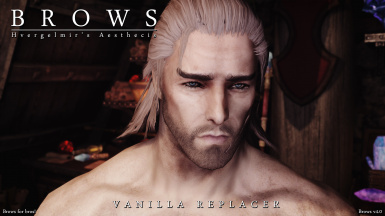 Brows replace all of vanilla Skyrim brow textures, with completely new high resolution, hand painted (from scratch) textures. This is done to provide the best photo realistic look possible. The aim is to stay true to the original look of the vanilla textures, but providing a more natural and realistic look. 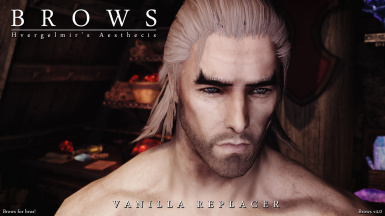 Brows also include an optional (but highly recommended) .esp file that adds a higher selection of completely new hand painted eyebrows, all including lighter and darker shades (including the vanilla brows as well). Many of these brows are based on brows from people in my life, including my own brows. Some are based on famous people. One thing is certain about Brows, there's something for everyone in here, and there's absolutely NO reason or excuse NOT to use Brows! Vanilla eyebrow textures (Legacy Skyrim) are 128x64 px. Brows Ultra pack at 2048x1024px and are mostly targeted towards screen archery. Brows High pack at 1024x512px and is recommended for the average modern rig. Then there's the Low pack at 512x256 and is recommended for lower end pcs. But if you ask me, you can barely see the difference unless you go FOV 25 and zoom in on the brows. It is recommended to install Brows with Vortex Mod Manager, it simplifies the process greatly and also makes it simple to deactivate or uninstall again if needed. Brows now come in a Fomod installer to make installation even easier. If asked to override, click yes. Please keep in mind this will override any other brow (re)textures you currently have installed. 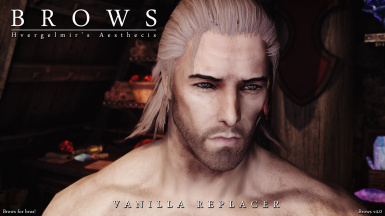 Please keep in mind this will delete any other brow (re)textures you currently have installed. If you know what you're doing you can enter the brow folders and delete each texture manually as you see fit.